It seems like everything that I’ve written about lately has a common thread: melatonin. When I started weaving together all those melatonin threads, a big picture was revealed. You could say it is a… tapestry of health. Melatonin may actually be the key to health and longevity. And this is something that I do not say lightly. Most articles about melatonin start off by calling it the sleep hormone, but that description misses the boat. Melatonin is so much more than a sleep hormone — and it really doesn’t cause you to sleep, per se. Instead, I will refer to it as the cancer-preventing, circadian rhythm setting, dementia-curing, anti-oxidant extraordinaire with an extra twist of anti-aging superpowers. This article will dig into how your body produces and uses melatonin. I’ll delve into some of the recent research studies on it — but know that I’m barely scratching the surface on a topic that would take volumes to thoroughly cover. Then I’ll explain some of the genes involved in producing and using melatonin. Stick with me on this article. It gets a little bit deep. But melatonin could arguably be one of the most important molecules for long-term health. Melatonin production can be broken into two categories: pineal production and extra-pineal production. The pineal gland is a little organ, about the size of a bean, located in the middle of the brain. It produces and recycles the cerebral spinal fluid, similar to the way the kidneys act as a filter for the rest of the body. Recap: You make melatonin in the brain (pineal gland) at night and it does a bunch of good things in the brain including setting your circadian rhythm. You also make melatonin in the rest of your cells, not just at night, and it acts as an antioxidant and within the immune system. Even low levels of light (1.5 lux) can suppress melatonin production. To put this into perspective, a night light puts out about 5 lux, and streetlights outside are around 10 lux. The maximum suppression of melatonin comes at around 305 lux – this would be similar to very bright indoor lighting. So any amount of light over 305 lux doesn’t add to melatonin suppression. The first thing that most people think of with melatonin is the supplemental melatonin pills you can get that are marketed as a sleep aid. Doses of supplemental melatonin range from 300mcg to 10 mg. An oral dose of 1 to 5 mg will raise serum melatonin levels to 10 to 100 times the normal levels within an hour. [ref] Taking melatonin during the day increases daytime sleepiness and drops body temperature (something that normally happens around the time you go to bed at night). [ref] Melatonin is easily absorbed orally, subcutaneously, intranasally, transdermally, and sublingually. For melatonin to have a signaling effect on cells, it needs a receptor available on the cell membrane. There are two types of melatonin receptors, usually referred to as MT1 and MT2 in studies. (More on these receptors in the genetics section below). There is a lot of epidemiological evidence tying cancer rates – especially breast and prostate cancer – to exposure to light at night, which decreases peak melatonin production. Often people dismiss this, thinking there must be another reason for the association between urban lights and cancer. That is a mistake. The association between shift work, light at night, and breast cancer has been known for decades. The World Health Organization lists light at night as a probable carcinogen. What makes you age? Why specifically changes as we get old? These are harder questions to answer than you might think. It is something that researchers are still grappling with. One theory of aging, posited by Harmon in the 1950s, is that it is caused by oxidative stress damaging the cell. The oxidative stress, in part, is caused by reactive oxygen species (ROS) created by the mitochondria. This damage from ROS accumulates and increases with age. Thus, antioxidants (resveratrol, vitamin C, etc) are thought to be anti-aging. Melatonin’s role in aging is thought to be two part: antioxidant activity and immune system stimulation. The decrease in melatonin as you age parallels the decrease in antioxidant activity and immunosenescence. While I don’t think melatonin is a silver bullet to prevent all aspects of aging, the bulk of the studies do show an overall anti-aging effect. Oxidative stress is theorized to be one cause of Alzheimer’s disease, due to the free radical damage to the brain. Increased lipid oxidation has been found in autopsied AD brains. The accumulation of amyloid beta plaque in the brain has long been associated with Alzheimer’s disease as well. In addition to clearing amyloid beta plaque, another way that melatonin can protect against Alzheimer’s is through the reduction of ROS in the mitochondria in brain cells. [ref] This may be the key, rather than amyloid beta clearance. There is uncertainty whether amyloid beta accumulation is causing AD vs being present along with AD. Below is an assortment of other studies on melatonin that I found interesting. Bringing them all together helps to make clear the wide-ranging effects of melatonin. The skin is the largest organ of the body, a protective barrier against the outside world and toxins. Skin cells can synthesize melatonin, and the amount of melatonin depends on ethnic background, gender, age. African Americans had the highest levels of melatonin. Exposure to UV-B radiation stimulates melatonin, which acts as an antioxidant in the skin. One way it does this is by promoting glutathione production. [ref] And yes, there are companies now producing skin cream that contains melatonin. One side effect is that melatonin increases melanin, thus darkening skin. There are numerous studies on supplemental melatonin for ADHD. Sleep problems often go hand-in-hand with ADHD for both children and adults. Staying up later while being exposed to light at night suppresses melatonin levels. Taking supplemental melatonin — or just blocking out the light at night — may be helpful to some people with ADHD. There have been several clinical trials using melatonin to help with IBS symptoms. Melatonin is produced within the intestinal tract under normal conditions, and it is also absorbed from foods. Animal studies show that giving low doses (1-10mcg/kg) of melatonin speeds up intestinal transit times, but higher doses (100-1000mcg/kg) slowed transit time significantly. [ref] IBS is often accompanied by increased transit time (diarrhea) or slowed transit time (constipation). In addition to transit time, melatonin also acts as an anti-inflammatory and an immune system modulator in the intestines. These functions also play a role in melatonin’s effect on IBS. There are several ways that your genes interact with melatonin: through production, cellular receptors, and metabolism. There doesn’t seem to be a lot of genetic variants, though, that significantly impact the production of melatonin. This may be because it is vital to so many processes in the body. Below is an overview of some of the studies associated with melatonin-related genetic variants that are available in 23andMe or AncestryDNA data. This gene codes for the MT2 melatonin receptor. This gene codes for the MT1 melatonin receptor. 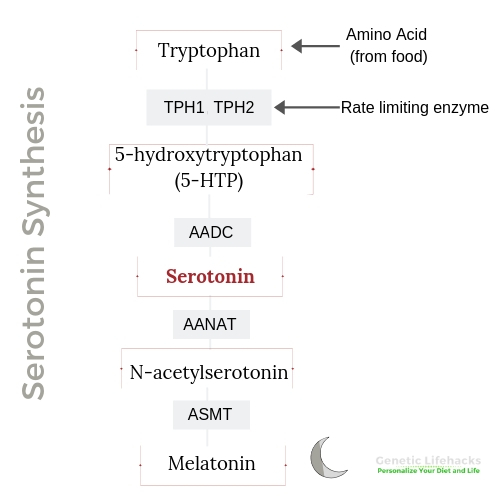 In the process of turning serotonin into melatonin, your body uses a methyl group. There are quite a few genetic variants that decrease the production of methyl groups, including MTHFR variants. I don’t have any studies, though, that show genetic variants that impact methylation also decrease melatonin. How can you raise your own body’s production of melatonin? The fact that melatonin production is shut off by light – specifically light in the 480nm wavelength or blue light – causes a mismatch with our modern society. Everything electronic, from your phone to your laptop to your TV, is giving off a lot of blue light. And the low-energy CFL and LED light bulbs all give off a lot more light in the blue wavelengths than the old incandescent bulbs did. Blocking blue light in the evenings with blue blocking glasses (orange colored lenses) has been shown to raise melatonin production by 50% within a week. Read more here about blue blocking glasses. So if melatonin is so awesome, should everyone be taking a melatonin supplement of it every day? I can’t answer that with a blanket statement that applies to everyone. The drawbacks to supplemental melatonin include that the regular tablets will give you a big peak dose, but not necessarily when your body would produce it. The time-release tablets can give you a more stable dose, but it also doesn’t peak when your body normally would. Some people feel groggy the next day after taking larger doses of melatonin, and some people report having headaches after too much melatonin. Everyone needs to make their own decision on what is right for their body. If you are younger, blocking blue light at night and relying on your natural production of melatonin may be the best option. For me (mid-40s), I’ve started taking time-release melatonin at 300 – 600 mcg per night (Life Extention 300mcg – around $.09/tablet). It’s not a huge amount — about what the body naturally produces — and it doesn’t seem to affect my sleep all that much. (I already blocked blue light in the evening with glasses, so I already slept well.) But all of the studies on Alzheimer’s, cancer, and aging have convinced me that maintaining higher melatonin levels may be really important to healthy longevity. If you are going to supplement with melatonin, choose a quality brand of supplements. A 2017 study: 31 different supplement brands, melatonin content differed from what was on the label in 71% of supplements. Additionally, 26% also contained serotonin. [ref] Labdoor.com is a website that shows the results of testing supplements for purity and content. I recommend checking out their rankings of melatonin supplements. Plants also produce melatonin as an antioxidant. Several common foods contain melatonin, which can transiently raise your melatonin levels. Methylene blue increases melatonin production. [ref] There are also some interesting theories around mitochondrial function, methylene blue, and Alzheimer’s disease. Melatonin is important to your body in many ways. It is produced in high levels at night in the pineal gland, setting your circadian rhythm and providing vital anti-inflammatory and immune functionality to the brain at night. This nighttime production of pineal melatonin is based on a lack of light hitting the retina. Melatonin is also produced both day and night at low levels in tissues throughout the body, countering ROS in the mitochondria and providing other benefits throughout the body. Melatonin is important in aging, Alzheimer’s, cancer, and many other chronic conditions. The circadian mismatch of artificial light at night (and lack of sunlight exposure during the day) may be reducing melatonin levels and increasing the risk of these chronic conditions.